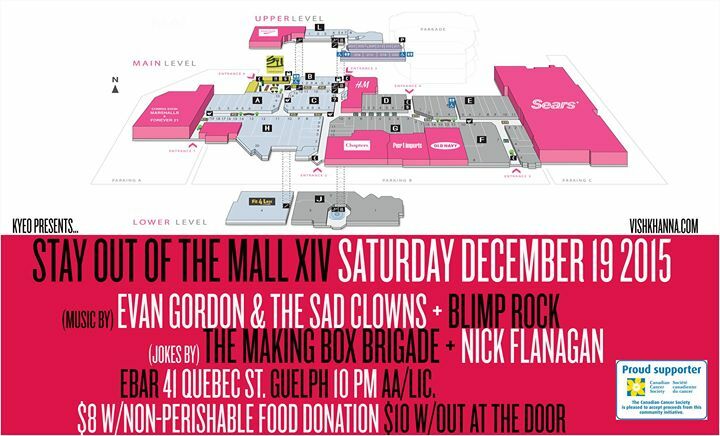 The 2015 edition of Stay Out of the Mall, a festive music festival held annually in Guelph, is shifting its format slightly to incorporate legitimate and intentional comedy. We’re also back to one day this year, Saturday December 19. Less festival-y but still festive. Over the past 14 years, the festival has benefited the Canadian Cancer Society towards leukemia research in memory of Sharon Marshall and collected a lot of non-perishable food items for local drop-in centres, food banks, and neighbourhood groups. In that sense, this year’s edition is similar with food donations heading to the Guelph Food Bank. The major difference this year is we’ve programmed professional comedians to perform during the festival and we’re stoked to announce this year’s dynamic line-up. 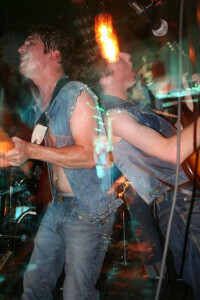 For underground rock fans, we have a reunion show by Guelph’s own Evan Gordon & The Sad Clowns. Since ramping up his work in Islands, Human Highway, his father James Gordon, and with his brother Geordie in the Gordon Brothers (formerly The Magic), Evan Gordon had seemingly retired the Clowns. We were pleasantly surprised when he emailed us about playing a special, rare set at Stay Out of the Mall and, like many others, are super psyched to see the band back in action. Toronto stand-up comedian Nick Flanagan is one of the most dedicated purveyors of his craft. A singer and writer in punk bands like Brutal Knights and Wrong Hole, Flanagan is a writer on the kids’ show Odd Squad and an actor you’ve likely seen in prominent TV commercials. He’s been a correspondent for Chart Attack and Toro and a frequent guest on top podcasts. He’s also toured the world over and is a friend and colleague of many of the planet’s most respected comics, so it’s super rad that he’s doing a set in Guelph. This past October, Toronto-based indie-rockers Blimp Rock launched a campaign to claim $700,000 that the playoff-battling Toronto Blue Jays supposedly owed them for co-opting the phrase #ComeTogether from the 2012 Blimp Rock song “Oh, Baseball.” Blimp Rock was not successful, nor were the Toronto Blue Jays. But the band is one of the most clever, funny, and fascinating pop entities going and they’re sure to entertain everyone in Guelph. Just don’t get on their bad side by appropriating their lyrics. Guelph’s comedy landscape has been wonderfully altered by The Making Box, a new venue (40 Baker Street) and nominal hub for collective improv and stand-up activity. People like Jay Reid have tapped into something highbrow about the form yet remain completely open and accessible to anyone who likes to laugh, while encouraging everyone to explore the comedian within. Here, this crew will take on their Making Box Brigade performing configuration for some interactive hilarity with the audience on-hand. Don’t be shy. Everyone is funny to somebody. More details and details will be available via the event’s Facebook page or KYEO.